From his early years as a disc jockey, music critic, rock singer, and bandleader to his lengthy career as a concert promoter, Kenny Weissberg lived all his childhood dreams—some of which turned into nightmares. 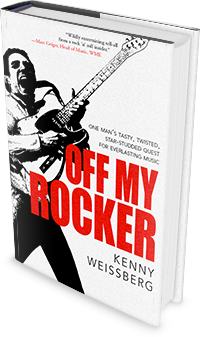 In Off My Rocker, he chronicles the mayhem and merriment of following the music for nearly six decades. As a young radio personality, Kenny basks in the glow of the free-spirited, post-Woodstock era but later rebels against the soulless corporate takeover of the music he’s loved forever. Along the way, he succumbs to the dark side, getting caught up in the deceit, greed, theft, and drugs so pervasive in the entertainment industry. With candor and self-deprecating humor, Kenny shares stories about the impressive cast of characters who cross his path, including showbiz icons Whitney Houston, Chuck Berry, Roy Orbison, B. B. King, Bill Murray, Ray Charles, and a host of others. Packed with vivid, behind-the-scenes details, this page-turner of a memoir will stay with you long after the closing credits.